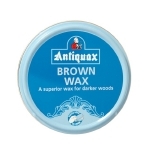 Antiquax Brown Paste Wax provides all the features and benefits of Antiquax Natural. 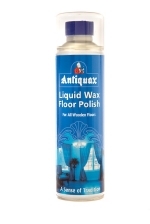 In addition, a stain within the wax enables you to colour and polish your furniture in the same application. The natural grain pattern within the wood is enhanced giving greater depth to the finish. Brown Wax is also useful for mild restoration where furniture has faded due to over exposure to sunlight or in areas where it has suffered mechanical damage - scuffing at the base of chair legs for example. Brown Wax is suitable for darker woods such as mahogany and stained oak. It is available in three sizes. Furniture Cream is a blend of natural waxes and silicones that effortlessly provide a superb high shine to all wood furniture. 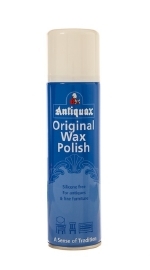 Antiquax Paste Wax Polish is a superior blend of waxes including beeswax and carnuaba. It has been specially formulated to resist finger marking and to penetrate and nourish all wood surfaces. 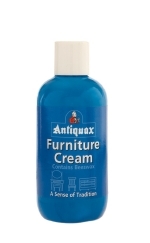 Use Antiquax regularly to maintain a deep lustre on your furniture and to prevent the natural wood grain from drying out in centrally heated rooms. Antiquax Paste Wax is natural in colour and is suitable for all wood shades including lighter coloured finishes such as ash and beech. It is available in four sizes and an easy to use aerosol. Antiquax Lavender Paste Wax Polish has the same ingredients and gives the same beautiful finish as Antiquax Natural Paste Wax. In addition, it adds the traditional polish scent, of fragrant lavender to your home. Use Antiquax regularly to maintain a deep lustre on your furniture and to prevent the natural wood grain from drying out in centrally heated rooms. Antiquax Lavender Paste Wax Polish is natural in colour and is suitable for all wood shades including lighter coloured finishes such as ash and beech. It is available in one size. 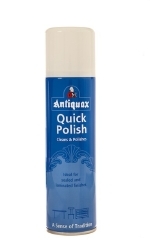 Quick Polish is a silicone based, wax free polish. It will not build up or smear. Use Quick Polish for a fast, efficient spray on - wipe off finish. It is an excellent regular use polish for modern surfaces.